$ cd Repos/ampere $ git fetch origin remote: Counting objects: 92, done. remote: Compressing objects: 100% (63/63), done. remote: Total 68 (delta 41), reused 0 (delta 0) Unpacking objects: 100% (68/68), done. 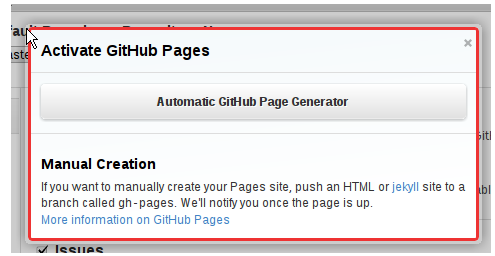 From git@github.com:tekkub/ampere * [new branch] gh-pages -> origin/gh-pages $ git checkout -b gh-pages origin/gh-pages Branch gh-pages set up to track remote branch refs/remotes/origin/gh-pages. Switched to a new branch "gh-pages"